Midway through the last century, a unique learning tool emerged, facilitating the comprehension of difficult subject matter. This technique known as "programmed instruction" became a popular method for learning complex disciplines. Contrary to popular belief, Dr. Dubin did not invent programmed instruction. According to an anecdotal story, a mathematician's daughter was having difficulty grasping the principles of college calculus. Every day the mathematician would compose and mail a simplified concept of only a few sentences, along with a brief diagram to his daughter. The calculus principle of a given day was linked theoretically to that of the previous day and designed to lead into that of the following day. By reading her daily measure of concatenated logic, the daughter soon became a calculus whiz.... so the story goes. In order to strengthen comprehension, the body of the text is reduced to single sentences that approach each new concept from various aspects. In this way, small doses of didactic medicine bring the concept into focus. Once the concept(s) of one page are mastered (reviewing the diagram as needed), the reader proceeds to the next page, which is carefully concatenated (linked) to the conceptual material on the following page. The illustrations in Rapid Interpretation of EKG's use real EKG tracings (not simulations), so what you see, is what you will experience professionally. Students in the medical sciences, often intimidated by electrocardiography, welcome this learning-by-understanding method. Memorizing patterns of EKG's has a dismal half-life. Using knowledge anchored in understanding, readers are pleased that, in a subtle manner, they also learn about cardiac physiology, pathology of the heart, and care of patients. The tradition persists. The most popular programmed texts owe their success to reader/student feedback. No author has been able to anticipate pages that might be difficult for neophytes to comprehend. So, reader input has become instrumental in the evolution of such texts. New explanatory text is added with each new printing to ease the learning process through areas of intellectual turbulence. The author guides your progress for rapid, seamless comprehension. Through the years, contemporary "programmed instruction" has evolved into "interactive learning" whereby the reader actively participates in his own learning process. Medical education need not be an oppressively serious task. Through the years Dr. Dubin's sense of humor has been persistently woven into the dialog with the reader, lightening the tensions of study. Many authors have mimicked his friendly, easy-going style. This section should be downloaded by now, but if it is not quite ready, please be patient a little longer. At the end of this section you will be amazed at how much practical information you have absorbed. Rapid Interpretation of EKG's employs interactive learning to achieve maximum understanding. The color illustrations from the new 6th edition are designed to display familiar (often entertaining) images for visual association and instant recall. This is a very effective, permanent memory tool. From Rapid Interpretation of EKG's copyright © 2015 COVER Publishing Co. Inc.
Digitalis causes a gradual down-sloping of the ST segment, to give it the appearance of Salvador Dali's mustache. As you see in the above illustration, each page begins with a large, simplified graphic representation that is explained by its caption. Link the following sequence of illustrations in your mind. Our main objective is to rapidly determine the heart rate from the EKG. First: Find a specific R wave that peaks on a heavy black line (our "start" line). Next: Count off "300, 150, 100" for every thick line that follows the start line, naming each line as shown. Know these numbers; you will use them throughout your career. Then: Count off the next three lines after "300, 150, 100" as "75, 60, 50." Now: Know these triplets so they are second nature. Make certain that you can say the triplets without using the picture. Where the next R wave falls, determines the rate. It's that simple! Wait a minute! If you consumed the illustrations and captions on the last few pages, you can already determine cardiac rate on EKG. What an accomplishment in such a brief time! Once the image and the caption are understood as a unified concept, the reader is encouraged to proceed with the simplified text below the illustration (usually about three sentences). Notice how a missing key word encourages interactive learning. Myocardial infarction ("infarct") occurs when a coronary artery supplying the left ventricle becomes occluded by a thrombus (blood clot), so an area of the heart is without a blood supply. The terms "myocardial ," "coronary occlusion," and "heart attack" refer to the same serious problem. The heart derives its own blood supply from the arteries, so when a coronary artery or one of its major branches is occluded, an area of the myocardium is without blood supply. The infarcted area is primarily in the ventricle, and deadly arrhythmias may result. NOTE: We understand that the coronary arteries also supply the right ventricle, so there is often some involvement of the right ventricle. But since most of the critical problems originate in left ventricular infarcts, myocardial infarction is usually conceptualized in terms of the left ventricle. The illustration and caption fuse as a concept. Then the brief programmed sentences below the illustration invite participation, in order to reinforce your understanding of the concept. This is not an exam; in fact, returning to an illustration for a word answer is a normal (planned) feature that aids your comprehension. Commonly, the thick left ventricle suffers myocardial infarction. The left ventricle is the thickest chamber of the heart; so if the coronary arteries are narrowed, the left ventricle (which uses the greatest blood supply) is the first to suffer from an obstructed coronary . Blood is pumped to all parts of the body by the powerful, thick, ventricle. NOTE: When we describe infarcts by location, we are speaking of an area of the left ventricle. Coronary arteries to the left ventricle usually send smaller branches to other regions of the heart, so an infarction of the left ventricle can include a small portion of another chamber. The completed text sentences are designed for greater depth of understanding, as they expand your grasp of each new concept with important related information. Interactive learning is also designed to prepare your mind for the new material ahead. On EKG the QRS complex represents ventricular contraction. The Q wave is the first downward wave of the QRS complex, and it is followed by an upward R wave, however the Q wave is often absent on EKG. Necrosis (death) of an area of the heart muscle produces a Q wave on EKG. 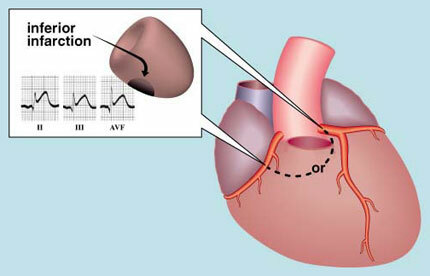 The Q wave, when present, always occurs at the of the QRS complex and is the first downward deflection of the complex. The downward Q wave is followed by an upward wave. NOTE: If there is any upward deflection in a QRS complex that appears before a "Q" wave, it is not a Q wave, for by convention, when present, the Q wave is always the first wave in the complex. The Q wave makes the diagnosis of infarction. The diagnosis of myocardial infarction is usually based on the presence of significant waves that are produced by the area of necrosis. NOTE: The Q wave is the first downward stroke of the QRS complex, and it is never preceded by anything in the complex. In the QRS complex, if there is any positive wave - even a tiny spike - before the downward wave, the downward wave is an S wave (and the upward wave preceding it is an R wave). Significant Q are absent in normal tracings. however small "q" waves are not significant. This interactive method continuously reinforces what you have mastered, while subtly relating important new facts that link to the concepts ahead. This interaction (with the author) facilitates learning and moves along quickly. Quite effective, isn't it? If there are Q waves in lead I and lead AVL, there is a lateral infarction. Please take a moment and glance at page 46 to make a mental note of the leads that have a positive electrode located laterally on the left arm. 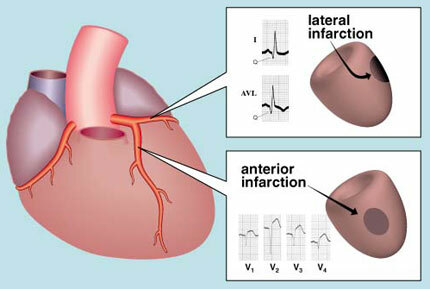 A lateral infarction involves the lateral portion of the ventricle. 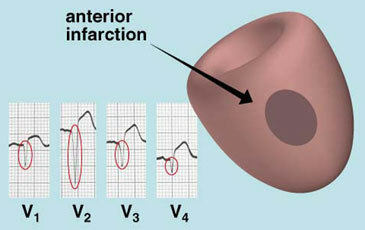 When a lateral infarction occurs, waves appear in leads I and AVL. NOTE: One might abbreviate Lateral Infarction as L.I. Just remember AVL for "Lateral" and "I" for Infarction (after all, Roman Numeral "I" for lead I is just a capital "i"). It's an easy way to recall the leads that demonstrate lateral infarction. Now you can see why this type of programmed instruction has made Rapid Interpretation of EKG's the world's best seller for over thirty years! 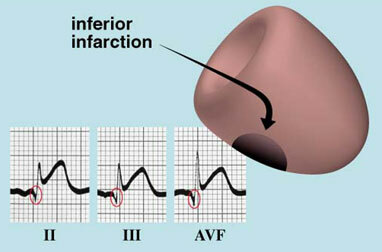 Inferior ("diaphragmatic") infarction is diagnosed by the presence of Q waves in II, III, and AVF. The inferior wall of the heart rests upon the diaphragm, so the term "diaphragmatic" infarction is sometimes used to indicate an infarction in the inferior portion of the left . An infarction is identified by significant Q waves in leads II, III, and AVF. NOTE: If I told you the way that I remember the leads for inferior infarction, this book would be banned. You may want to make your own memory tool for remembering the leads for Inferior ("diaphragmatic") Infarction using "two, three, and F."
An incorrect (missing word) answer is just as useful as the correct word (perhaps better! ), since it encourages reconsideration and rethinking of the basic concept. This brief mental exercise reinforces a proper understanding of the concept. Q waves in chest leads V1, V2, V3, or V4 signify an anterior infarction. NOTE: The chest leads are mainly placed anteriorly on the chest, so this is a good way to remember the leads for anterior infarction. The presence of Q waves in V1, V2, V3, or V4 indicates an infarction in the anterior wall of the ventricle. NOTE: Statistically, anterior infarctions are very deadly, but fortunately, immediate treatment with intravenous thrombolytic medications or angioplasty with stenting has improved the survival rate substantially. You're doing great! If you've been following the illustrations and text so far, you know what a myocardial infarction is and how to make the diagnosis on EKG. You also know how to identify the location of the main types of infarction. It is common practice to determine the general location of an infarction, but with a little anatomical knowledge of the heart's coronary blood supply*, we can make a far more sophisticated diagnosis. There are two coronary arteries that provide the heart with a continuous supply of oxygenated . 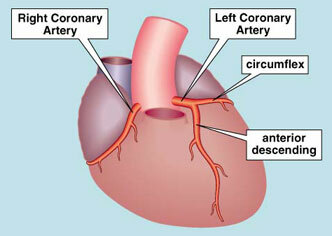 The Left Coronary Artery has two major branches; they are the Circumflex branch and the Descending branch. The Right Coronary Artery curves around the right . * The pulmonary artery has been "surgically" removed in this illustration to show the origin of the coronary arteries at the base of the aorta. A lateral infarction is caused by an occlusion of the Circumflex branch of the Left Coronary Artery. An anterior infarction is due to an occlusion of the Anterior Descending branch of the Left Coronary Artery. blood to the portion of the left ventricle. supplies blood to the anterior portion of the ventricle. branches of the Coronary Artery. The base of the left ventricle receives its blood supply from branches of either the Right or the Left Coronary Artery, depending on which artery is "dominant." terminal branch of either the Right or the Coronary Artery. of that patient's left ventricle. NOTE: Left or Right Coronary "dominance" denotes which coronary artery is the major source of blood supply to the base of the left ventricle. Right Coronary dominance is by far most common in humans. Now you know how to determine the specific arteries blocked in two important types of infarction and which arteries are most likely to be blocked in an inferior infarction. Pleased with your accomplishment?